From 2007 to 2008, the annual number of noncitizen migrants apprehended in the United States or at its borders dropped by about 170,000. In 2008, apprehension numbers hit their lowest point since 1975. The decrease in apprehensions may indicate that the economic crisis and resulting scarcity of jobs made the United States a less attractive destination in 2008. It is also possible that recent increased enforcement measures have effectively deterred potential migrants. 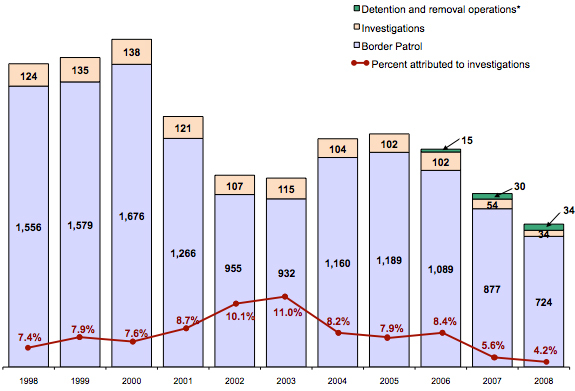 Drawing from the Yearbook of Immigration Statistics, published by the Department of Homeland Security's (DHS) Office of Immigration Statistics, this Spotlight provides data on apprehensions, detentions, returns, and removals of unauthorized noncitizens in the United States as of 2008. Immigration enforcement entails locating, arresting, detaining, and removing non-U.S. citizens (including lawful permanent residents) in violation of immigration laws. Immigration enforcement activities are carried out by Customs and Border Protection (CBP) and Immigration and Customs Enforcement (ICE). ICE may train state and local law enforcement officers to perform immigration law enforcement functions. The Border Patrol is responsible for enforcing border areas between legal ports of entry. Inspectors verify admissibility of entrants to the United States at official ports of entry. Investigators apprehend unauthorized immigrants in the interior of the United States. Within ICE, the Special Agent-in-Charge (SAC) offices are responsible for administering and managing all enforcement activities within the office's geographic jurisdiction. Detention and removal officers are responsible for the custody and tracking of individuals in removal proceedings. Apprehension and removal data gathered by DHS count events, not individuals. In some cases, individuals may be apprehended or placed through removal proceedings more than once in any given year. Immigrants are apprehended (arrested) when found to be in violation of immigration laws. In 2008, DHS immigration officials made just under 800,000 apprehensions. The Border Patrol accounted for about nine in 10 of all apprehensions in 2008. 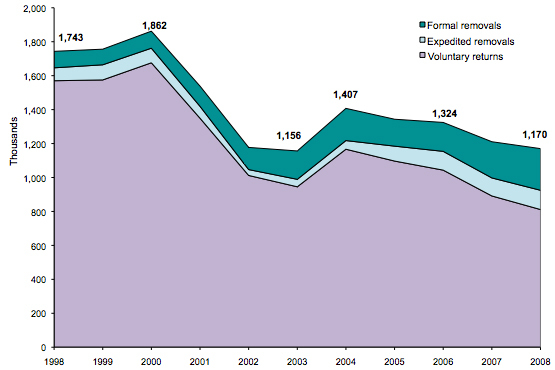 Apprehensions along the Southwest border have decreased each year since 2005. The Tucson, Arizona, sector accounted for more Border Patrol apprehensions in 2008 than any other sector. Mexican citizens accounted for 88 percent of all apprehensions in 2008. Individuals who are apprehended and not released from custody are kept in detention facilities. The United States currently holds detainees in state and local prisons, contract detention facilities, and federal prisons, as well as "soft" detention alternatives. In 2008, immigration officials detained a record high of 378,582 individuals. More than 61 percent of detainees in 2008 were from Mexico. Nationals from Mexico, El Salvador, Honduras, and Guatemala accounted for about 63 percent of bed days in 2008. Foreign-born individuals who have to leave the United States are categorized as either "removals" or "voluntary returns." DHS uses two types of removals: expedited removal and formal removal. Formal removal proceedings are usually conducted during immigration hearings that involve judges from the Executive Office of Immigration Review (EOIR). There were about 359,000 removals in 2008. Removals nearly doubled between 2000 and 2008. Mexican nationals made up seven out of every 10 removals in 2008. Expedited removals accounted for almost a third of all removals in 2008. There were over 811,000 voluntary returns in 2008. The number of removals and voluntary returns combined stood at about 1.2 million in 2008, the lowest level since 2003. There were more than twice as many voluntary returns as removals in 2008, but removals made up a larger share of the total than a decade ago. Immigration enforcement entails locating, arresting, detaining, and removing non-U.S. citizens (including lawful permanent residents) who violate the Immigration and Nationality Act (INA) of 1952, as well as those who attempt illegal entry, enter without authorization, or those who enter legally but later lose their legal status. The Illegal Immigration Reform and Immigrant Responsibility Act (IIRIRA) of 1996, which amended INA, dramatically changed previous enforcement procedures, categories, and definitions, especially pertaining to detention and removals. For example, IIRIRA increased border and interior enforcement, and the penalties for unlawful presence in the United States. For information on INA amendments, visit the U.S. Citizenship and Immigration Services (USCIS) website. Since the creation of the Department of Homeland Security (DHS) in 2003, two bureaus within DHS have been responsible for immigration enforcement: Customs and Border Protection (CBP) and Immigration and Customs Enforcement (ICE). Most immigration enforcement activities fall under four main categories: border patrol, inspections, investigations, and detention and removal. CBP, which oversees enforcement at and between ports of entry, handles border patrol and inspections. ICE is responsible for enforcing immigration laws within the interior of the United States. Investigations are a part of ICE operations. While the Office of Detention and Removal (DRO) is officially part of ICE, services are also contracted out to CBP. Created by Congress through IIRIRA, the 287(g) program authorizes DHS to enter into agreements with state and local law enforcement agencies, allowing officers trained by ICE officials to enforce certain aspects of immigration law. In order to deputize state and local law enforcement officers, ICE must sign a memorandum of agreement (MOA) with the head of the local agency and the governor of the state. DHS announced in October 2009 that it had standardized 287(g) MOAs with 67 state and local law enforcement agencies; 55 of these agreements have been signed and 12 are awaiting final approval by local jurisdictions. MOAs were standardized to outline a clear objective for the program — the identification and removal of criminal noncitizens — and to delineate enforcement authorities granted by the agreement. This move to standardization occurred after the wide variance in individual 287(g) agreements prompted concern about the program's uniformity and goals. Under old agreements, some agencies obtained status information for only those individuals convicted of felonies while others obtained status information for individuals who had been arrested for minor crimes or violations, such as traffic offenses. DHS credits the program for the removal of about 24,000 individuals from January to October 2009. For more information on 287(g) agreements, visit the ICE website. Read more recent changes to U.S. enforcement policy in the March 2009 Policy Beat and the August 2009 Policy Beat. CBP Border Patrol officers are responsible for enforcing 8,000 miles of U.S. land and water boundaries between legal ports of entry (designated points where immigration officials can regulate entry). The goal of the Border Patrol is to maintain a presence along border areas in order to prevent individuals, such as criminals and unauthorized migrants, from entering U.S. territory outside official ports. CBP inspectors verify admissibility of entrants to the United States at official ports of entry, such as a land-border crossing or airport. If an individual is deemed inadmissible, the inspector has the authority to allow a person to withdraw his or her application for entry, refer the case to a formal removal hearing, or, in some instances, to order removal themselves under a process called expedited removal (more on expedited removal here). ICE investigators apprehend unauthorized immigrants in the interior of the United States through formal investigations similar to those of other law enforcement agencies. Investigators often work in task force teams. The five major categories of investigations are criminal, worksite enforcement (employment of unauthorized workers), fraud, smuggling (of unauthorized migrants), and investigations of those who entered without inspection or lost their legal status. SACs develop, coordinate, and implement enforcement strategies that are in line with national policies and procedures. SAC offices have considerable discretion in tailoring immigration enforcement strategies — including investigations — for specific geographic regions. There are 26 ICE Special Agent in Charge (SAC) principal field offices (see Map 1). ICE detention and removal officers are responsible for the custody and tracking of individuals in removal proceedings. This includes ensuring the individual's basic needs are provided for, removal procedures are carried out appropriately, and detainees are delivered to the proper authorities in their home country. Immigrants are apprehended (arrested) when found to be in violation of immigration laws, when attempting illegal entry, or when found to have overstayed or violated conditions of their immigration status. Violators are apprehended through Border Patrol or investigation activities. Individuals are sometimes also apprehended by state and local law enforcement officials as part of the 287(g) program. According to DHS, immigration officials made 791,568 apprehensions in 2008 — the decade's lowest number. The number of apprehensions in 2008 was 17.6 percent lower than in 2007 (960,758) and 56 percent lower than in 2000 (1,814,729), the decade's highest. Notes: *Detention and removal operations (DRO) includes arrests of fugitive and nonfugitive immigrants under the Office of Detention and Removal Operations National Fugitive Operations Program. Disaggregated DRO apprehensions data are only available starting in 2006. Source: U.S. Department of Homeland Security, Yearbook of Immigration Statistics, Enforcement, 2008. Available online. The Border Patrol made 91.4 percent (723,840) of all apprehensions (791,568) in 2008, while investigations in the interior were responsible for 4.2 percent (33,573) of apprehensions. The arrest of fugitive and nonfugitive individuals under ICE's National Fugitive Operations Program accounted for 4.3 percent of apprehensions. There are a total of 21 Border Patrol sectors along the northern and southern borders. 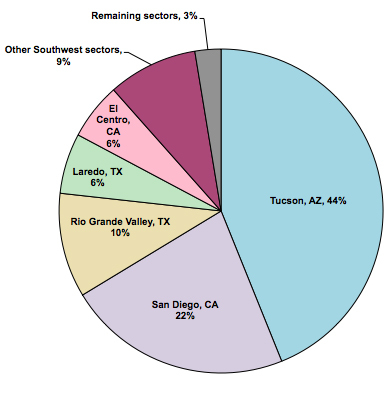 Nine of these sectors are along the Southwest border: two in California, five in Texas, and two in Arizona (see Map 2). Of the Border Patrol apprehensions, 97.4 percent (705,022) occurred along the Southwest border. Apprehensions along the Southwest border decreased by 39.8 percent between 2005 (1,171,428) and 2008 (705,022). Since 1999, the highest number of apprehensions in Southwest sectors was in 2000 (1,643,679) and the lowest was in 2008 (705,022). Five of the nine Southwest sectors accounted for 88.4 percent (640,198) of all border apprehensions. These five sectors were Tucson, Arizona; San Diego, California; Rio Grande Valley, Texas; Laredo, Texas; and El Centro, California. The Tucson sector alone accounted for 43.9 percent (317,709) of the 723,840 Border Patrol apprehensions in 2008, followed by San Diego, California (162,392 or 22.4 percent); Rio Grande Valley, Texas (75,476 or 10.4 percent); Laredo, Texas (43,659 or 6.0 percent); and El Centro, California (40,962 or 5.7 percent) (see Figure 2). Mexican citizens accounted for 88 percent of all apprehensions in 2008. Mexican citizens accounted for the majority of apprehensions in 2008 with 693,592 (87.6 percent) of the 791,568 apprehensions. Citizens of Honduras and Guatemala — the next largest countries of origin — each accounted for about 3 percent (23,789 and 22,670, respectively). From 2004 to 2008, Mexican citizens accounted for the majority of apprehensions. ICE detains individuals who are apprehended and not released from custody. Since the implementation of the Illegal Immigration Reform and Immigrant Responsibility Act (IIRIRA), in 1997, detention has become mandatory for cases classified as "criminal." However, not all those detained have criminal records. In some instances, individuals may be detained indefinitely because they are considered a threat to national security or because their country of origin will not accept responsibility for them. Persons appealing a removal decision or applying for asylum status may also be detained until their cases are settled. As of August 2009, ICE reported having 32,000 detention beds across as many as 350 different facilities largely designed for penal, not civil, detention. The facilities are either jails that county authorities run or detention centers that private contractors operate. The Obama administration is currently restructuring the immigrant detention system to make it more closely resemble a civil detention system. See the ICE Fact Sheet Alternatives to Detention. See the MPI report Immigrant Detention: Can ICE Meet Its Legal Imperatives and Case Management Responsibilities? Immigration officials detained 378,582 individuals in 2008. The number of individuals in detention increased 21.6 percent from 311,169 in 2007 and 59.3 percent from 237,667 in 2005. More than 61 percent (about 231,000) of detainees were from Mexico, up from 49 percent in 2007. Individuals from Mexico accounted for 32 percent of bed days, indicating their relatively brief average detention stay. Salvadorans followed with 11 percent, Hondurans and Guatemalans 10 percent each, the Dominican Republic 3 percent, and Jamaica, China, Haiti, and Brazil 2 percent each. Both removals and voluntary returns result in the departure of a foreign-born individual from the United States. Enforcement actions categorized as removals generally place weightier criminal and/or administrative consequences on reentry. In addition to the removal itself, individuals can be subject to fines, imprisonment for up to 10 years for failing to appear at their hearings or for failing to depart, and/or bars on future reentry that can be up to 20 years or even permanent. The End of "Catch and Release"
The practice of "catch and release" entailed the Border Patrol releasing apprehended non-Mexican migrants into the United States, where they awaited removal hearings. Most likely, the practice was a way of coping with overcrowded immigrant detention facilities. However, many individuals failed to appear for their removal hearings. After President George W. Bush requested congressional funding for additional detention beds, DHS began a "catch and return" program that detains individuals until they are returned to their home countries. In 2006, DHS ended "catch and release." Voluntary returns are most common among noncriminal cases where the Border Patrol has made the apprehension. Through voluntary return proceedings, individuals waive their rights to a formal hearing and agree to pay removal expenses. By doing so, they can reapply for admittance without consequence. An expedited removal is used for those who attempt to enter with improper or fraudulent documents. An inspector orders the expedited removal at the time of attempted entry. The individual is not allowed to consult legal counsel or present his or her claim before an immigration judge. Any person subject to expedited removal who raises a claim for asylum — or expresses fear of removal — is given the opportunity to explain his or her fears to an asylum officer in a credible fear interview. Formal removals are most commonly decided by an immigration judge for more severe INA and criminal violations, such as illegal entry, drug smuggling, felony crimes, controlled substance violations, and prostitution/solicitation. Formal removal proceedings are usually conducted during immigration hearings that involve judges from EOIR under the Department of Justice (DOJ), as well as prosecutors from DHS. Individuals in proceedings may be represented by attorneys at their own expense and may also appeal the court's decision through the DOJ's Board of Immigration Appeals. Individuals seeking asylum in the United States may make an asylum claim during removal proceedings. Penalties for those who are found to violate immigration laws can include fines, jail time, and restriction of future admission. Of the 358,886 removals in 2008, 27.1 percent or 97,133 were classified as criminal. Note: Removals are events, not individuals. In other words, the same individual can be removed more than once in the same year. Removals increased 90.4 percent from 188,467 in 2000 to 358,886 in 2008. The majority of individuals removed in 2008 were Mexican nationals (246,851 out of 358,886 removals, or 68.8 percent). The next-largest source countries were Honduras (8.0 percent or 28,851) and Guatemala (7.7 percent or 27,594). Expedited removals accounted for 31.6 percent (113,462) of total removals in 2008. The share of expedited removals as a percentage of all removals fluctuated between 2001 and 2008, peaking in 2001 (36.9 percent of the 189,026 total removals) and bottoming out in 2003 (20.8 percent of the 211,098 total removals). Of the 811,263 voluntary returns in 2008, 70 percent were Mexican or Canadian nationals who were apprehended by the Border Patrol. Note: Voluntary returns are events, not individuals. In other words, the same individual can be apprehended and "returned" to his or her home country more than once in the same year. Adding up all removals and voluntary returns in 2008, the total comes to 1,170,149. That figure is about 3 percent lower than in 2007 (1,210,772) but still above the 2003 level of 1,156,000 (see Figure 3). In 2008, voluntary returns accounted for 69.3 percent of the 1,170,149 total removals and voluntary returns, while removals were 30.6 percent. In contrast, voluntary returns accounted for 90.1 percent of the 1,743,273 total removals and voluntary returns in 1998 (see Figure 3).